Every year, thousands of expecting parents start prenatal testing to find out if it’s a boy or a girl…and instead learn the baby is going to die. Anencephaly. Trisomy 18. Potter’s sequence. They’re called “incompatible with life.” But they’re not incompatible with love. Many doctors recommend immediate termination, but more parents are carrying their babies for as long as possible, often without guidance. 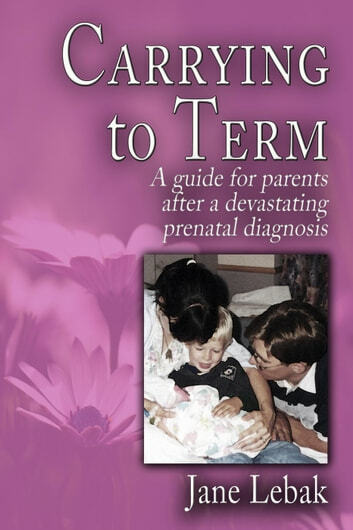 Carrying to Term: A Guide for Parents after a Devastating Prenatal Diagnosis addresses every aspect of the longest (and shortest) months of your life. From emotional issues to spiritual struggles to funeral-dress shopping while you’re still seven months pregnant, Carrying to Term offers strategies for parents struggling just to make it through the day. You can forge a best-case scenario out of a worst-case scenario. You can bond with a baby who hasn’t yet been born. Parents have learned to make memories in brief windows of time, and you can too. Author Jane Lebak carried to term with Emily Rose, diagnosed with anencephaly at 22 weeks, and has been active in the infant loss community ever since. Based on her experiences and those of the CTT forum she moderated, the guide offers practical options for doing what parents do best: loving their babies. Healing through Humor: Change Your Focus, Change Your Life!